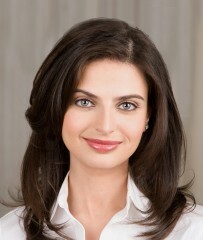 Bianna Golodryga will be the new co-anchor of Weekend Good Morning America, ABC News announced today. Golodryga takes the spot vacated by Kate Snow, who joined NBC in March. It’s a fast rise for financial correspondent Golodryga, who joined the network in July 2007. Golodryga will join co-anchor Bill Weir, news anchor Ron Claiborne and weather anchor Marysol Castro on the broadcast beginning this Saturday. “Since coming to ABC News in July 2007, Bianna has distinguished the network with her reporting on the economy and recent financial crisis,” Westin said in an e-mail to the ABC News staff about the announcement. • Chris Cuomo – Promoted to anchor at ABC’s 20/20 and to run their legal unit. • Kate Snow – Now at NBC. • Ashleigh Banfield – Joined ABC News in January. • Alexis Glick – No longer with FBN. Still up in the air where she ends up next. • George Stephanopoulos – Named GMA co-anchor. • Bianna Golodryga – Now Weekend GMA co-anchor.